Dreamworks are one talented bunch. 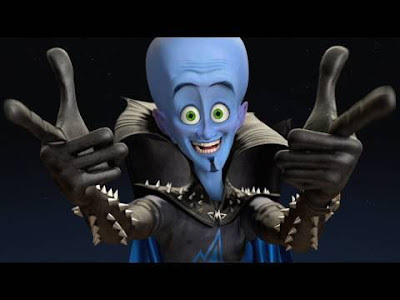 As the world watches the clock tick down to the final instalment of Shrek (and LOST too it seams, though that's a different company), the animation powerhouse is already hard at work on it's next masterpiece; Megamind. A super-hero tale told from the villains perspective, Megamind is the best super-villain the world has ever known, but when one of his botched evil plans actually results in the death of his arch rival Metro Man, the fiend suffers an identity crisis. Who is a wannabe world conqueror without a wannabe world saviour? So he fixes the hero shortage the only way he knows how - he builds one. Named Titan, the villainous creation meant for a life of heroism soon discovers the dark side is more fun, and ruling the world is for chumps - he's out to destroy it. That leaves the diabolical Megamind in place of been the one thing he never wanted to be - a hero. Not that you could tell half of that from the official first full length trailer below. Still never one to complain, I can tell you with funny man Will Ferrell as Megamind, Brad Pitt stepping into the ring as Metro Man, and a few gags or more at the expense of Superman's origin, it's pretty easy to tell come November what the next animated hit will be. Me - I was sold at Will Ferrell... check him out. Awesome! Those graphics look sweet! This could be one the movie that truly rivals Iron Man 2 this year.